My new scholarly book on H.P. Lovecraft has just been published, and I’m experimenting with giving a PDF away for free. Walking With Cthulhu: H.P. 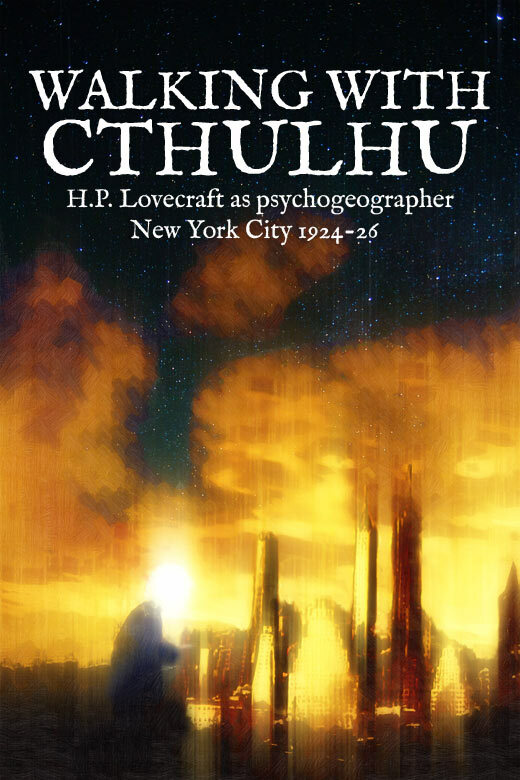 Lovecraft as psychogeographer, New York City 1924-26 is 55,000 words, 198 pages, illustrated. In exchange for the ‘free’ bit, can you give the new book a web link on your blog, a mention to your Facebook friends, or just a quick tweet? Download it free (PDF, 4Mb) — or buy a new paperback copy here. Update: Kindle user? It’s also on the USA Kindle Store and the U.K. Kindle Store. Introduction: A Walk in New York. 1. H.P. Lovecraft and the psychogeographers. 3. The nature of the New York streets. 4. A note on H.P. Lovecraft and immigrants. 5. H.P. Lovecraft’s New York coffee houses and ice-cream parlours. 6. H.P. Lovecraft and the subway. 7. It emerged from the subways! 8. On mystical and occult New York. 10. New York as R’lyeh, sunken city of Cthulhu. Please note that ‘free’ does NOT mean ‘Creative Commons’. I ordered the book though, because I don’t read well electronically. I’m quite intrigued – looking forward to it!